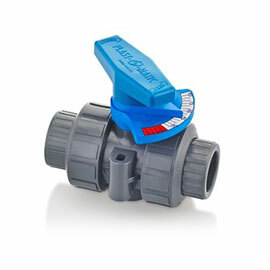 Manual Ball Valves – Plast-O-Matic Valves, Inc.
All Descriptions Manual Ball Valve Lockout/Tagout Retrofit Kit for Ball Valve Metering Manual Ball Valve Retrofit Kit 2-hole ball 3-hole ball 3/4" socket tee 1" socket tee 1 1/4" socket tee 1 1/2" socket tee 2" socket tee 3" socket tee Stem Extension for MBV or TMBV All Process Connection Sizes 3/8" 1/2" 3/4" 1" 1 1/4" 1 1/2" 2" 3" 4" 20MM 25MM 32MM 40MM 50MM 63MM 90MM 110MM 3/4" Mini 1" Maxi 1" Ladish 1 1 /4" All Body Materials PVC CPVC Polypro PVDF All Seal Materials EPDM Viton All Connection Types Threaded Socket BSP Threaded Metric Socket 2" 3" 4" 5" 6" 7" 8" 9" 10" 11" 12"
The original Engineered Ball Valve features trunnion design, dual sliding seats, blowout proof stem, mounting lugs. 3/8″ to 4″ sizes in PVC, CPVC, Natural Polypro, PVDF with FKM or EPDM. Available with NPT, socket, BSP, Sanitary, and other connection types. 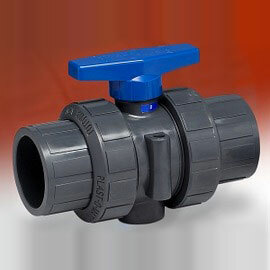 Data Sheet 3/8" - 2"	 Data Sheet 3" & 4"	 Dimensional Drawing 3/8"-2"	 Dimensional Drawing 3", 4"
Three-way version offers the same trunnion design, dual sliding seats and other premium features found in our 2-way valves. 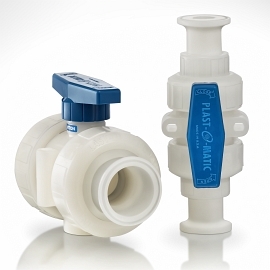 1/2″ – 2″ sizes in PVC or CPVC, with 2-hole ball to prevent mixing, or 3-hole ball to prevent momentary deadhead. 3″ & 4″ sizes in PVC, CPVC, PP and PVDF. 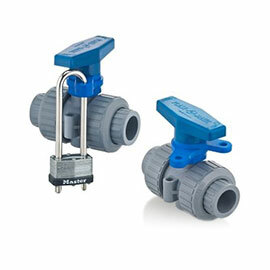 Designed to accept most standard OSHA approved locks/shackles, Series MBVL is available as complete valve assembly or as kit for field retrofit. 1/2″ – 4″ sizes. Visual indicator for use with or without characterized control balls. Series MBVM available as complete valve assembly or as kit for field retrofit. 1/2″ – 2″ sizes. 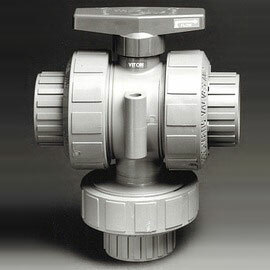 Series MBVSE can be specified with a new valve or purchased for field retrofit. Specified in lengths from 2″ – 12″. For new valve, add suffix -SE00 to the part number, where 00 is the length in inches. 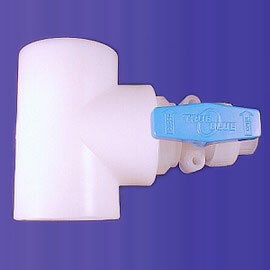 For example, a 1/2″ PVC MBV with socket connections and a 6″ extension would be MBV050VS-PV-SE06. Add MBVSE-1.2 price to new valve for total list price.